The mayor's first act after publicly addressing his historic ouster was to do a photo-op with a bunch of cute kids, surrounded by toys. After speaking about being ousted from office this afternoon, Rob Ford launched a toy drive. Following Rob Ford’s judicial ouster this morning, the reporters who’d lined up to receive paper copies of the decision (it was not available electronically—we had to put it online ourselves) made the short walk from the University Avenue courthouse to City Hall, to interview whomever they could. First lawyer Clayton Ruby and Paul Magder, the two people who brought the case against Ford, gave a press conference, but Ford was nowhere to be found. And then, about half an hour later, he showed up, and it was weird. Reporter: Mayor, are you gonna run in a by-election? Several reporters, simultaneously: Will you run in a by-election? Ford: Absolutely. I’m gonna appeal it. Ford: I’m not one to not run for the great citizens of the city. I fought for ’em for two years—er, 12 years—and I’m gonna continue to fight for ’em as long as they want me here. And the people are gonna speak. I’m not gonna have people say, “you can’t do this, you can’t do that.” I’m gonna fight for the taxpayers like I always have. I’m gonna thank them for their support. The calls are coming in fast and furious now, telling me to fight it, telling me to run again. People, uh, I want to thank ’em very much. And I’ll never give up on the taxpayers of this city. Reporter: What’s your message to Ford Nation? Ford: Um, we’re ready to go. At the council…[inaudible because of camera shutter noise]…and there’s an appeal process. And I hope I win the appeal, and if I lose there’ll be a by-election. And I guarantee I’ll be the first one in there, and we’ll be out like we did two years ago, and that’s all I’ve got to say. Reporter: Were you surprised by the decision this morning? Ford: Of course I was surprised. It’s disappointing and surprising. You’ve just got to roll with the punches. And this is, uh, you have to have skin on you like an alligator. 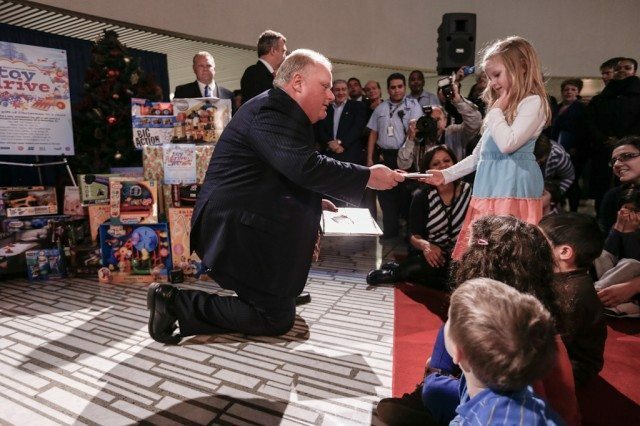 The very next thing Ford did after speaking about his historic removal from office was go downstairs to the City Hall rotunda to launch the 2012 edition of the Mayor’s annual toy drive, a pre-Christmas charity drive initiated by Ford’s administration in 2011. There, amid piles of toys, including a Dora the Explorer tricycle and several dollhouse-esque playsets, the mayor gave a prepared speech, then sat down on the floor with several small children, plucked from City Hall’s daycare for the photo op. He spoke a few quiet words to them, told them goodbye, and then ascended the steps to his office and disappeared, once again, behind closed doors.